John Hunter (1728-1793) and his older brother William (1718-1783) revolutionised medical education by focusing on the necessity for first-hand experience with human cadavers. While William mixed with high society, John dealt with the ‘resurrection men’ who provided a steady supply of bodies for anatomy demonstrations. His experiences as a surgeon in the Seven Years’ War (1756–63) provided the basis for his most important work, A Treatise on the Blood. 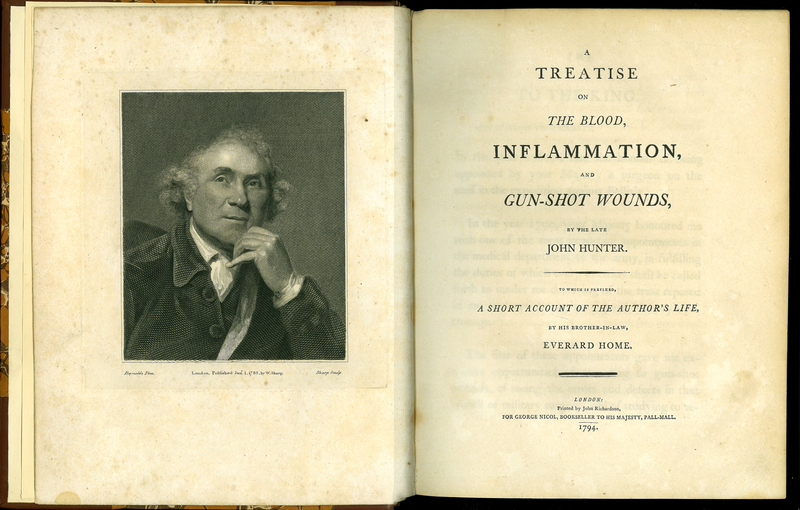 John Hunter, “A Treatise on the Blood, Inflammation, and Gun-shot Wounds,” ourheritage.ac.nz | OUR Heritage, accessed April 26, 2019, http://ourheritage.ac.nz/items/show/10162.